Hayneedle is a retailer of everyday home items and furniture, based out of Omaha, Nebraska, United States. The privately held company is an online only business, selling its range from the Hayneedle.com website. What makes them a popular choice over regular department stores is there wide range of special offers and deals, that can be redeemed with Hayneedle coupons. Here at Coupofy we keep an up to date list of these so you never have to waste time searching elsewhere. Simply take a look before ordering and you're sure to make great savings! Hayneedle was founded in 2002 under the name Hammocks.com by Doug Nielsen, Julie Mahloch, and Mark Hasebroock. As the name suggests their initial inventory focussed on hammocks. They then opened several other online stores, each focussing on a niche product. 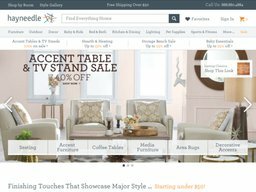 In 2009 they decided that they would merge all of their properties together under the Hayneedle name, becoming much like a traditional department store in terms of the housewares that made up their selection of products. After Doug Nielsen stepped down in 2014, Jon Barker became the CEO of the company. Today they employ over 500 people and has the highest A+ rating as assessed by the Better Business Bureau. The Hayneedle selection covers a wide variety of housewares and everyday items, including Furniture, Garden & Outdoors, Home Decor, Baby & Kids, Kitchen & Dining, Home Improvement, Games & Entertainment, Health & Fitness, Bed & Bath, Lighting, Storage Solutions, Gifts, and even Pet Supplies. There is also a dedicated Sales page where you can find a bargain, and these savings can be compounded by using one of our Hayneedle coupon codes. The site is very easy to navigate using the above categories, and you can also use the search bar if you have something specific in mind. Once in a category the product listings can be refined further with subcategories, and you can also use parameters like material, brand, price, popularity, and more, to help you find exactly what you want. Other customer ratings and reviews can also help you make up your mind. If buying for somebody else you might want to consider getting them a Gift Certificate (values between $10 and $500), then they can make their own purchasing choices. Regular customers might consider signing up to the rewards program that allows you to earn points for each purchase, which can later be redeemed for discounts. You can even get points for writing reviews for your purchases! There is also an affiliate program that allows you to earn commission for every person you refer that goes on to buy something. Hayneedle accepted most common credit cards for payment, such as Mastercard, Visa, Discover, and American Express. You can also easily checkout and pay with PayPal, as well as PayPal Credit which allows you to pay for the item at a later date with a credit line from PayPal rather than the store itself. Their own branded gift certificates can be redeemed for all or just part of your order, with the remainder being paid by card or PayPal. Just prior to the payment step during online checkout you will see a special promotional box. This is where you can enter a Hayneedle coupon code to redeem its offer. The easiest way is to simply choose one at Coupofy and copy and paste it over. If entered correctly you should see a confirmation message and your total order cost drop according to the corresponding offer. Most orders at Hayneedle are shipped via FedEx. Their cheapest option is Economy Shipping, which costs $4.99 and can take up to 7 business days. If your total order cost is $50 or over, you can use this option for free and do not need to use a Hayneedle promo code to claim it. Other options include Convenient Ground, 3 Day, 2 Day and Next Day. The cost of these vary depending on the value of your order, so you should check this during checkout after you've entered a delivery address. Orders to Alaska, Hawaii, APO or FPO addresses, and Puerto Rico, require you to choose the 1-Day or 2-Day service and may incur an additional charges. P.O. boxes are excluded. If your order large items like furniture you will have to use their Freight Delivery service. Curbside is free (the item is taken off the truck outside your home), while you can pay extra for it to brought to the door or taken in to your room of choice. Hayneedle operate a 30 day returns policy, allowing customers to return most items within 30 days of the delivery date, for a refund or exchange. These items must be in their original brand new condition, with all the packaging and contents. The customer is responsible for the original and return shipping costs unless they received the items in error or they arrived in a defective condition. To initiate a return you must login to your online account and click the link in your order history. You will then by given a Return Merchandise Authorization letter, which should be printed and included in the return package. This will also include the return shipping address. Gift certificate purchases will be refunded in the form of store credit. @fluties_flake Hi Lori, could you please DM us the item information, we would like to look into this further. Thank you. @ArjuKadri This is wonderful to hear, thank you so much for sharing Arju. @DavidMallory73 Thank you so much for your kind words David. @Penguin1012 This is awesome to hear, thank you so much for sharing Anita.